Boort is a rural township 90 km north-west of Bendigo and 35 km north of Wedderburn. It is on the railway line from Wedderburn Junction to Robinvale. The township was named after the Boort pastoral run, taken up in 1846 by John Bear. The name is thought to be derived from an Aboriginal word meaning smoke. The Boort homestead was south-east of Lake Boort, and the township is north-west of the lake. Boort pastoral run was acquired by Frederick Godfrey in the late 1840s. Godfrey cut a channel from the Loddon River to the Keningapanule Creek, which drained into the swampy depression which became Lake Boort. 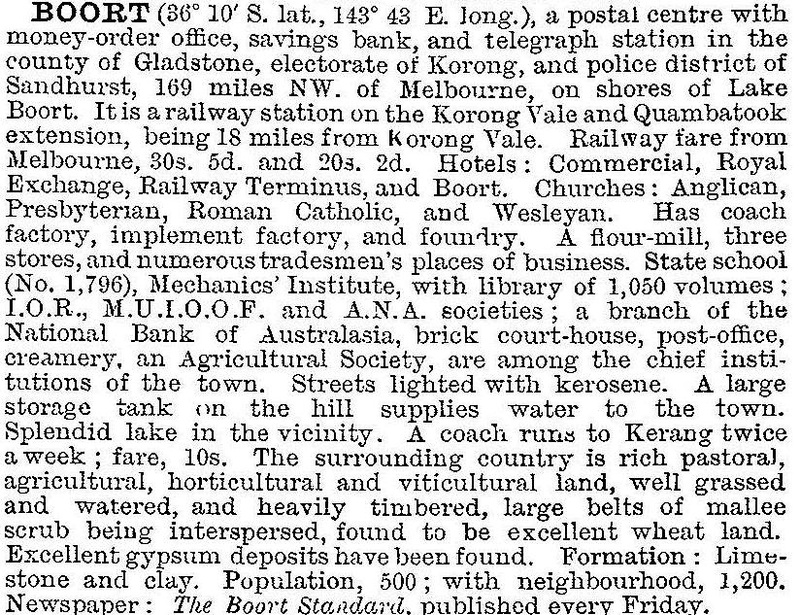 From about 1873 onwards farm selections in the Boort district were taken up. The Loddon Waterworks Trust was established in 1882, and six years later a local Boort irrigation trust took over irrigation. The water was for stock purposes. A school and an Anglican church were opened in 1877 and 1879. The railway line from Wedderburn Junction was extended to Boort in 1883, which remained a terminus until a further extension to Quambatook in 1894. During that time a Catholic church (1890) was opened, a local newspaper started (1887) and the agricultural society (1881) ran successful annual shows. The State Rivers and Water Supply Commission absorbed the local irrigation trust in 1905 and extended the Waranga Eastern Channel to the Boort district in the 1920s. Boort’s population steadily increased from then until the 1960s, although the township’s increase probably also came about from farmers choosing to reside in an urban rather than a farm setting. The small private hospital was replaced by a larger unit in 1923, which is turn was enlarged to a District Hospital in 1961. A high school was opened in 1963 and a swimming pool was built in 1967. Boort’s proximity to extensive wheatlands was acknowledged when the silos were expanded to one million bushels capacity in 1965. The land west of the Loddon River, and further west of Boort, has been affected by salinity from rising water tables. It has been counteracted by the laser profiling of paddocks to lessen water retention during wet periods. Boort’s steady growth in population and central location in the former Gordon shire made it a superior choice for the shire’s administrative centre. The offices were moved to Boort from Durham Ox in about 1909 and the council meetings were also moved there around the outbreak of World War II. Boort continues to be the leading township in the district, maintaining a population about 55% higher than Pyramid Hill’s. Since the local government amalgamation in 1995, Boort has a subsidiary office for the Loddon shire. In addition to Lake Boort there are Lake Lyndger (non-permanent) and Little Lake Boort, all within close proximity of each other. Little Lake Boort has recreational areas on its shoreline, a caravan park and boating facilities. A harness racing track and the showground are north of the town. Within the town there are the P-12 district school (230 pupils, 2014), six churches, a hall, a hospital, an aged persons’ hostel (1980), a swimming pool, a hotel, a motel, and a community centre. South of the town there are an airstrip and a speedway. Whilst Boort is not a tourist destination, its recreation areas are well kept and the main street has tourist attractions. Boort tomato relishes and wool quilts are also a surprise. The local newspaper, the Boort Standard and Quambatook Times, was incorporated in the Loddon Times (Kerang), in 1996. The Boort district was the site in 2014 for the first mainland licensed poppy farms, breaking the Tasmanian monopoly. Money was set aside in the 2014 state budget to construct a new 32-bed hospital and 25-bed aged care facility in Boort. The census population in Boort and environs in 2011 was 1173, and 28% of employment was in farming.